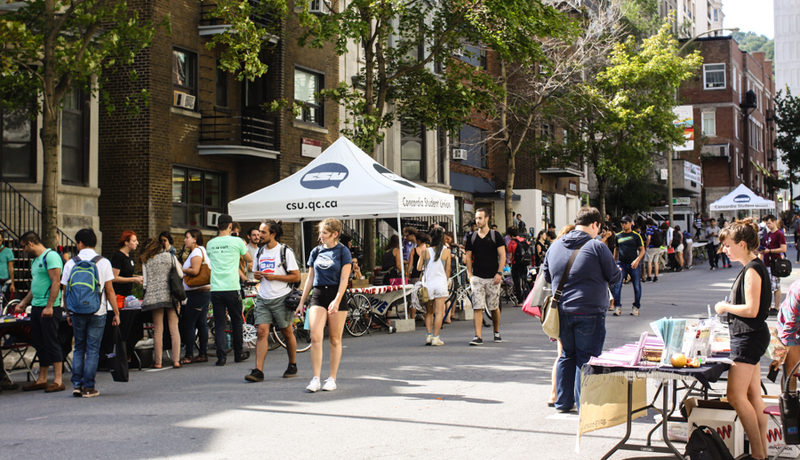 Last Thursday, the Concordia Students’ Union (CSU) hosted the RETHINK Sustainability Street Fest as part of its 2014-15 orientation week. The event, which focused on examining sustainability in terms of its relationship to community structures and anti-oppression, was held on Mackay between Maisonneuve and Sherbrooke and lasted most of the day, starting at 11 a.m. and finishing around 5 p.m.. The festival was meant to explore a broader definition of sustainability: one that identifies economic, social, and individual well-being, along with traditional environmentalist ideals, as necessary for the creation of a sustainable society. “We really wanted to expose the diversity that can be encompassed in sustainability,” Jessica Cabana, VP Sustainability at CSU, told The Daily. “Sustainability is not just about environmentalism. […] It’s broader than that, it’s also about the big social aspect of social justice issues, social structures, […] and how we can actually make sure to be self-sustaining,” she added. Several organizations tabled at the event, including a bike collective, various organic food organizations, and social justice groups like the Centre for Gender Advocacy (CGA) and the Concordia branch of the Quebec Public Interest Research Group (QPIRG). Students looking for more information and passers-by intrigued by the closed-off street walked from table to table, inquiring and taking pamphlets. Two students, both of whom recently transferred to Concordia from other universities, Aoife Baldwin-Maher and Kalale Dalton-Lutale, said that they had come just to pick up free agendas when they saw the festival by chance. “It’s awesome from my perspective because I’m not used to so many student-organized things, that’s really nice in my opinion […] the fact that it’s the student body sustaining itself, there’s so much mutual support in that,” said Baldwin-Maher. Cabana told The Daily that the festival had made numerous efforts to be sustainable itself, including not having any corporate sponsorship (it was funded in part by the CSU operations budget and the rest came from the Concordia Community Orientation Initiatives Fund), buying compostable materials whenever possible, and placing volunteers next to bins for trash and recycling to make sure people put their waste in the appropriate bins. Aimee Louw, an attendee at the event who works with Accessibilize Montreal, a QPIRG working group that aims to make Montreal more accessible to people with disabilities, noted that accessibility is also a part of sustainability. “I recognize that structural, infrastructure changes take a long time, or take a lot of commitment, but what I would like to see right now is a pledge of commitment by Concordia to improve their buildings,” said Louw.